Labor lawyer Duane Beeson was honored Wednesday for six decades of union service. Photo by Gloria La Riva/Media Workers Guild. Duane Beeson, activist lawyer and senior partner in the Media Workers’ own law firm, Beeson Tayer & Bodine, had something like a retirement dinner Wednesday night. 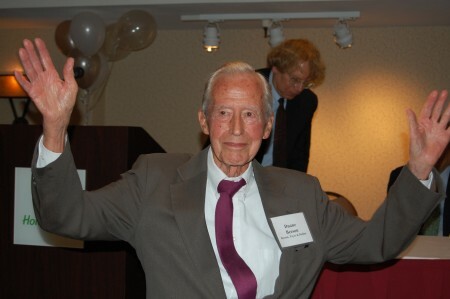 Beeson, 90, a onetime staff attorney for the NLRB back when the federal agency took its job of defending worker rights a lot more seriously than it sometimes does today, was given the Peggy Browning Award for his decades of service to organized labor. The award is named for the late NLRB board member, now the namesake of a foundation that supports fellowships for law students interested in representing unions. During an award dinner in San Francisco Wednesday, Beeson recalled a court battle in which he had to coax the judge not to drop a case against Beeson’s client, Typographical Union leader Donald Lane, who was then found guilty of criminal trespass. Lane was handing out flyers at a supermarket urging shoppers to boycott the Contra Costa Times. He was a bit perplexed to see his own lawyer arguing he be prosecuted — “I can still remember the look on his face,” Beeson recalled — but the lawyer had his reasons. The conviction was overturned on appeal, achieving a significant gain in union speech rights. Geoff Piller, Beeson’s law partner, introduced Beeson as a rare embodiment of technical skill and deep humanity. Piller also noted that Beeson has a habit of mentioning his imminent retirement every year, but has never followed through. He’s been a little cagey about it lately, too, and plans to continue working on at least one big case. This year, however, Beeson may mean it — sort of — when he says he intends to retire.